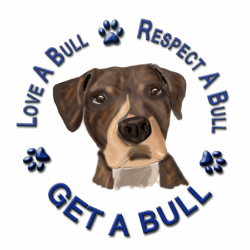 Get A Bull Inc. rescues and rehabilitates bully breed dogs in Long Island and surrounding areas. Dogs taken into the Get A Bull program are from municipal shelters or urgent surrender situations. Over the years, the organization’s love of the seniors in their program has led to an additional focus on fospice (foster/hospice) and senior dog rescue. We just can't resist those greying faces!. We are currently seeking Foster homes, Fospice homes and “Forever Foster” homes for senior dogs. A foster home would be a temporary situation where you care for the dog until a more permanent home can be found. Over the years we have taken in Fospice dogs from our local shelters - often these are dogs dying and we provide mostly palliative care and a whole lot of love so they do not spend their final days in a shelter. Finally our "Forever Foster" program allows people who might not be able to take on the costs of a senior dog, but really want to help one - you provide the love and Get A Bull covers medical costs for life!. Forever Foster homes may last for weeks and sometimes they end up lasting for years! If you would consider opening your heart and home to an older dog who really needs you, please email us at getabullrescue@gmail.com for more information or complete our foster application. Faye is looking for a forever foster . . .